The new Saab 9-5 will be aimed at Audi and BMW rivals. Spyker Cars revealed its product plans for Saab on Monday, and the company envisions a core lineup of three or four model lines rooted in a premium image. Spyker says Saab will be anchored by the 9-3, the 9-4X and the 9-5. A smaller car line, the 9-1, could be added, though it's not part of the current plan. The 9-5, redone on the same platform as the Opel Insignia and with General Motor Co. technology, launches this summer. The product portfolio will be “renewed completely,” Spyker says, and a new 9-4X arrives in early 2011, followed by a new 9-3 in 2012. Spyker says each of its models will continue to have variants--for example, a 9-3 convertible model and a 9-5X--to broaden the scope of the line. Saab aims to be competitive in the midsize luxury segment against the BMW 3-series and 5-series, and Audi's A4 and A6. Spyker is a Dutch producer of supercars. The two car lines will operate as standalone companies but will use the new name Saab Spyker, if shareholders approve the change at a Feb. 12 meeting. 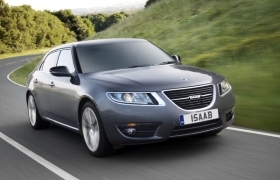 Saab expects to make and sell 100,000 to 125,000 cars annually. The business plan will require about $1 billion in funding for Saab, which will come from GM's $326 million in redeemable shares, a loan from the European Investment bank and cash.